Home / Koi Show / Show success! Quite a big moment in the project this week, with results in from my club’s annual Garden Show this week. And for the first time, kohaku’s bred by me but owned by someone else have gone on to win notable show prizes. You may remember earlier this year, I had to sell two of my best home bred kohaku’s to help raise funds for replacement brood stock following the early season spawning disaster. 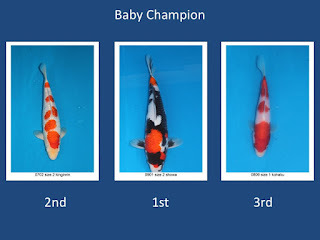 One of those two fish was the kohaku that won the 2015 South of England baby champion award, and I sold it to fellow Kangei Koi Club member, Nigel Parren. 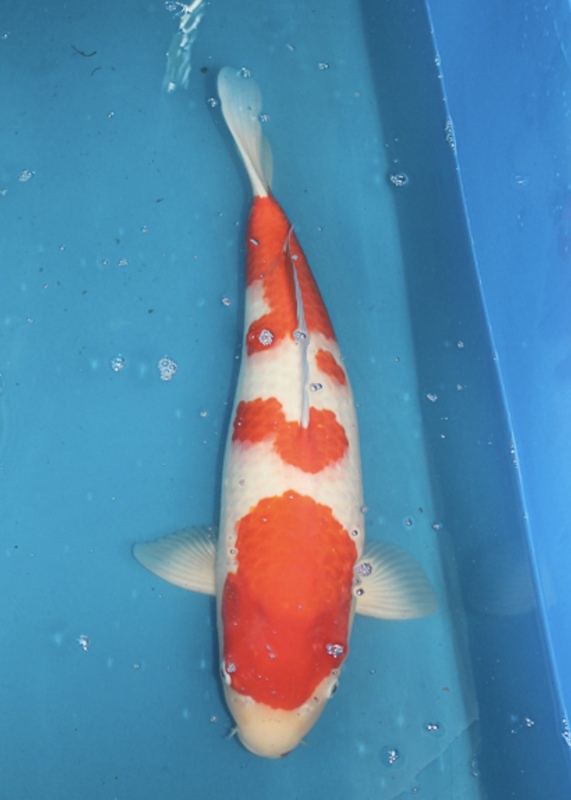 He exhibited it in our club Garden Show this autumn and last night we found out that it beat 15 other koi to place second out of 16 koi in size 4 kohaku. Our JSC judge Jamie Johnston , visited Kangei to announce the results and to take us through his judging decisions. 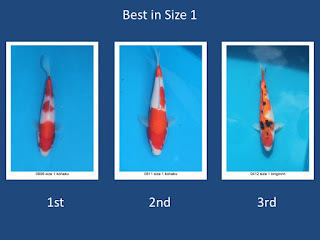 And when we got to the few koi in contention for size 4 kohaku, he said it took an hour just to judge this single category – because the top few were very tightly matched and the differentiating factors so slim. In the end, I was chuffed to see the kohaku was still looking great and placing second in that level of competition was very pleasing. 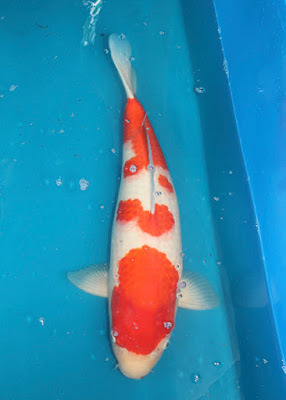 Plus, the koi is still improving and I believe has potential to improve; as Jamie commented on the night, if the sashi tightens up a little more, it would help the koi compete and as the koi is only a sansai (3 summers old), and spawned in July 2014 – so only 2.5 years old, I would like to think there is some time for the sashi to improve. 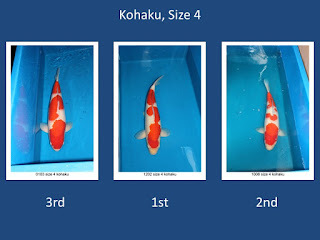 Here are the fish that placed in size 4 kohaku at the show, with Nigel's fish in second place. 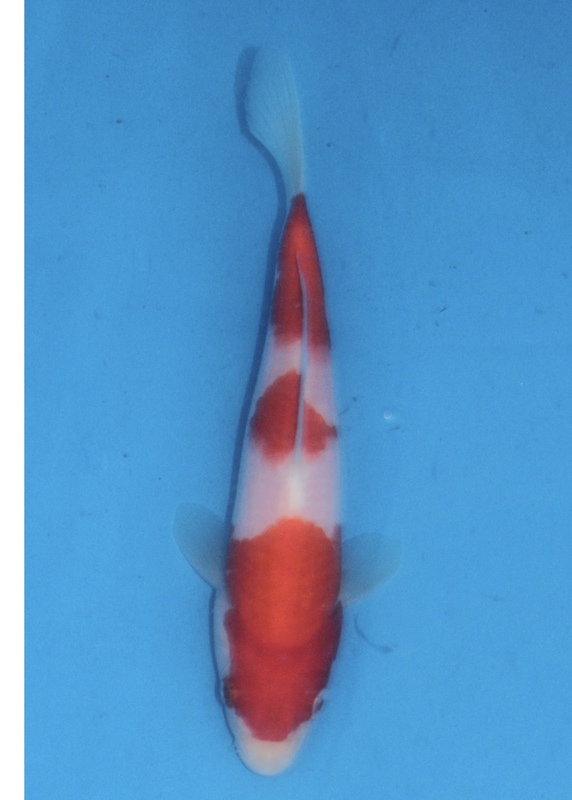 The other one of the two fish I mentioned went to another hobbyist living in the south of England; it’s the male kohaku that came 3rd in size 4 kohaku at the South of England koi show this year, and I am hopeful the owner will give this koi a run out at a show next year. A bonus at the Kangei Garden show this year was a great performance from a little kohaku picked up from us by club mate, Nik Holtom. I don’t remember the exact story behind this kohaku, but I recollect that it was one that slipped through at first selection and after sitting in a holding tank for a month or two, one of us spotted this little kohaku that had been selected for moving on , but had some quality, and we put it to one side out of the way. We find fish like that occasionally – the problem is, once it’s passed through the selection process and is moved out of the growing on system – it’s a one way trip. Once out of the growing on system, the temperature differences are too great to re-introduce it, and also – after being out of the growing on system for several months, the size differential to it’s peers is also considerable. I think when Nik picked the fish up, it was something like 5 cm long. At that same time, it’s peers that had been growing on over the winter were pushing 30cm long. Nik gave the fish special treatment, and 7 or 8 months later it had grown to 17cm – just about large enough for Nik to enter into the Kangei Garden show. 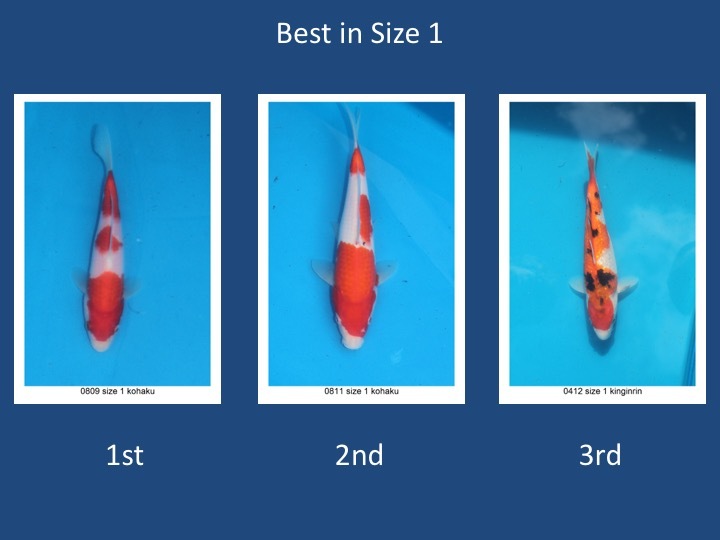 The kohaku came 1st in size 1 kohaku out of 4 koi, and 1st in size 1 overall out of 7 koi. It went on to place 3rd in the running for baby champion out of 17 koi in sizes 1 and 2. 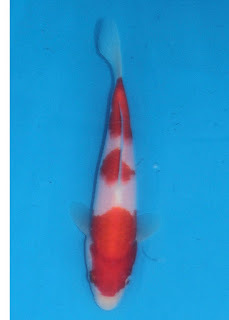 Jamie Johnston commented about this little kohaku that it had beaten the koi that it had due to it’s good volume for such a small fish, good skin quality and he also commented on the kiwa which he said particularly good for such a small fish. 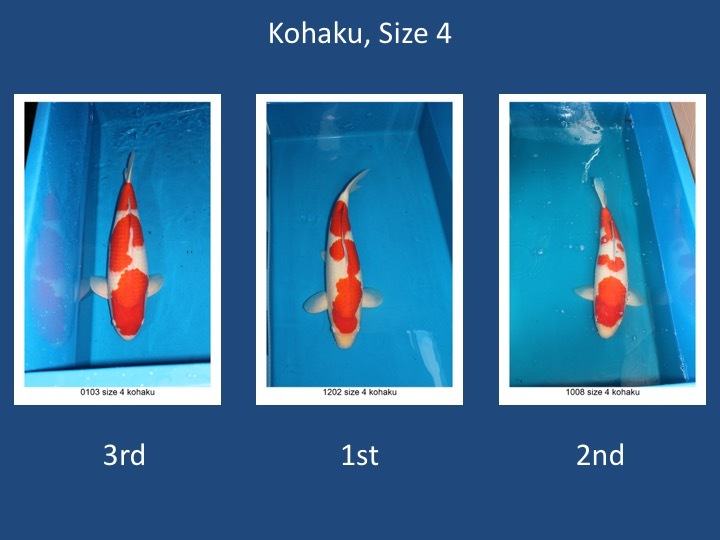 The little kohaku also placed 3rd out of 17 in the competition for baby champion - which takes sizes 1 and 2 together. I feel very proud these guys in the club managed to achieve good awards at this increasingly competitive show and it has added weight to the consideration that perhaps I could be less tight handed about releasing some of our better kohaku’s so that I expand our range of experience of seeing them in a show situation. It’s a hot topic at home. The fact is, I do not have a grow on facility that I can dedicate to rearing my best few fish after the age of around just 12 months old! That's a big hindrance, both in terms of limiting my overall capacity - and also, in terms of being able to provide the right husbandry for the fish prior to shows. And with small fish, like the one Nik took, they don't fit neatly into our overall breeding and rearing set up. Each way you look at it - we've had to focus so much on the breeding and rearing to tosai process, that we are way off being optimised for the subsequent stage. At that point (after the winter grow on season), what I did this year is to throw the best few into the females tank and give them a summer there. But frankly, that’s sub – standard. Yes, they’ll be looked after well from a health perspective. But their growing season is cut short, and that’s not ideal – particularly in their first 3 years. This year, the growth on our nissai has been far less than the previous year, and it’s in large part down to the shortened growing season. Also, the food we're using is being supplied to grow brood fish - not show fish. We can continue as we are – just be as discerning as possible and keep only a few to be grown in the females tank and accept the shortened growing period, and compromise over the feeding regime. This is the current plan. Alternatives include setting up a new tank system, dedicated to growing on our best few fish. And the other options is to find the right people to grow them on our behalf. At the moment, I’m not particularly comfortable with the last option – and we’ve made it through this year now, so the next time I’ll need to think about it will be next summer. The successes from Nigel and Nik have shown us that perhaps we can consider the later option. Finally, we have 3rd selection to complete this weekend on the August #2 spawning. The tank is at that stage where water quality is being pushed too far by the bio load, and we simply need to strip some of that out of the system and leave more space for the ones we want to keep. Most of the fish are up to around 3 or 4 inches and that’s a good size to evaluate the fish at. Time will be tight this weekend and I only have a few hours on Saturday morning and the same again on Sunday morning to complete the whole then, and I will try to capture some pictures and video of any decent ones that we find.